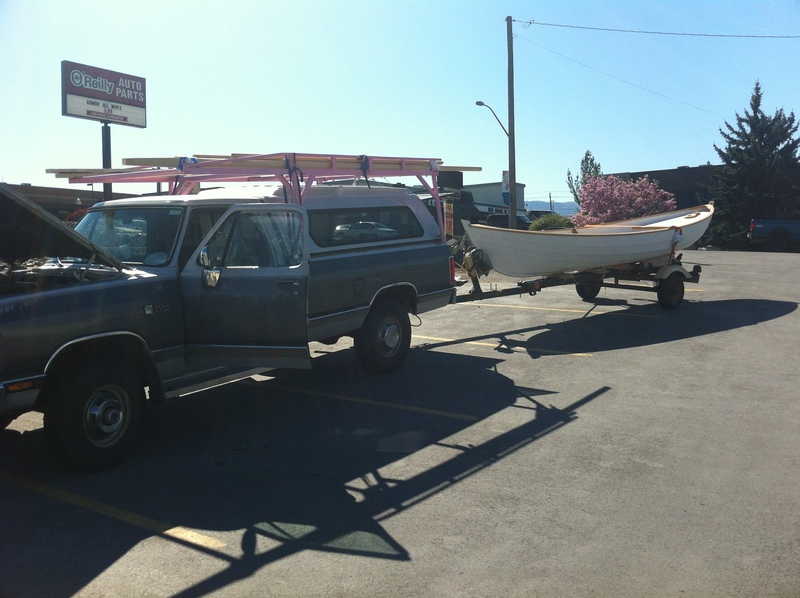 The sails weren’t finished, the trailer hadn’t come in to the boat yard, but the hull and Andy Boat were on the way. 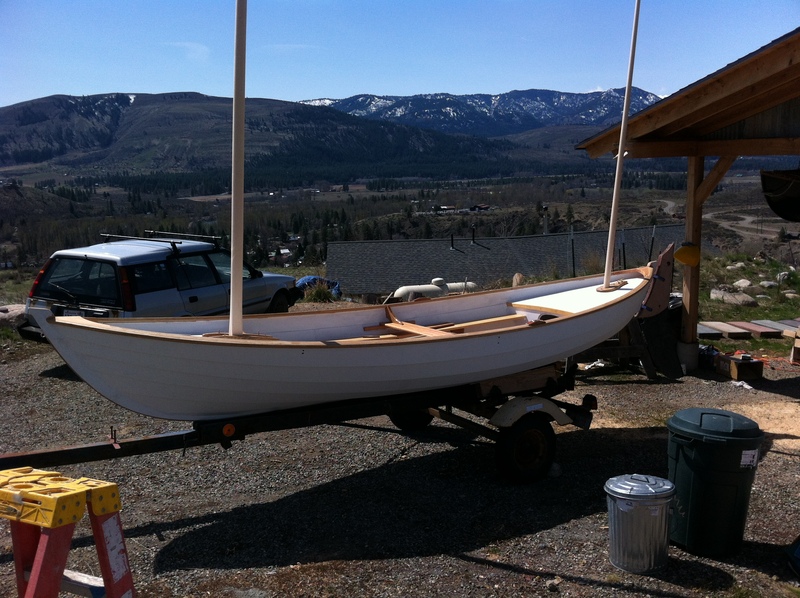 Boat said that he would cover the boat with primer, put a coat of varnish on the woodwork and haul it down to Portland. With each week’s pictures showing impressive progress and craftsmanship, I could hardly wait. Perhaps Andy could hardly wait to be done with the project, but I was anxious to my hands on my dream boat and to start the painting and staining. I knew that I could rent a garage someplace, though that could prove to be expensive and a pain to haul over there and back. I hoped for something a little closer to home and ideally with someone who might be interested in boats. I sent an e-mail to anyone who I thought had a garage or might know someone who had a garage and waited. A number of people responded, but mostly people said, “what a nice boat.” Encouraging, I thought, but it won’t get the boat painted during a rainy Oregon spring. Then one night I looked at my e-mail and saw a note from my neighbor Stuart. It was perfect. Stuart is a likeable guy, but we never seemed to connect due to timing or life. His house is about eight houses away and his garage is exactly the right size to house the boat and be able to walk around it. I soon had the garage cleaned out, got to know Stuart a little better and about a week in advance of Boat’s arrival I started watching the weather more intently than usual (my normal morning obsession is to turn on my marine radio and listen to the NOAA broadcast’s current observations, weather predictions, and yesterday’s weather stats- geeky, I know). The forecast was typical for the Pacific Northwest in April: rain, cloudy, rain, more rain. About five days before it called for a sunny Saturday and a partly cloudy Sunday. Now normally, I don’t believe the forecast more than twenty four hours in advance, but I looked on this window of sunshine as fate. As those two sunny days stayed consistent through the week, I forced myself not to get too excited. I kept sticking with the bizarre idea that Andy had been some figment of my imagination. That perhaps, somehow, he had already built one of these boats and had only been sending me old pictures. This was an elaborate forgery. My wife, rightfully, thought I was being crazy. On Friday evening, I went door to door, rounding up neighbors to become part of the crew that would haul the boat off the trailer and onto cradles in the waiting garage. Involving as many folks as I could in my plot was almost as much fun as getting the project itself completed. I woke up early on Saturday, and despite our normal prohibition against turning on the computer on Saturdays, I fired it up and was relieved to find no e-mail from Andy saying he had bailed out. I turned on my normally dormant cell phone and left to run a bunch of errands, including stopping at the farmer’s market to get Andy a big jar of honey to show my gratitude for all his efforts.